Unfortunately: I find that a baseball hitting instruction fix for one player with this challenge, may not work for another. 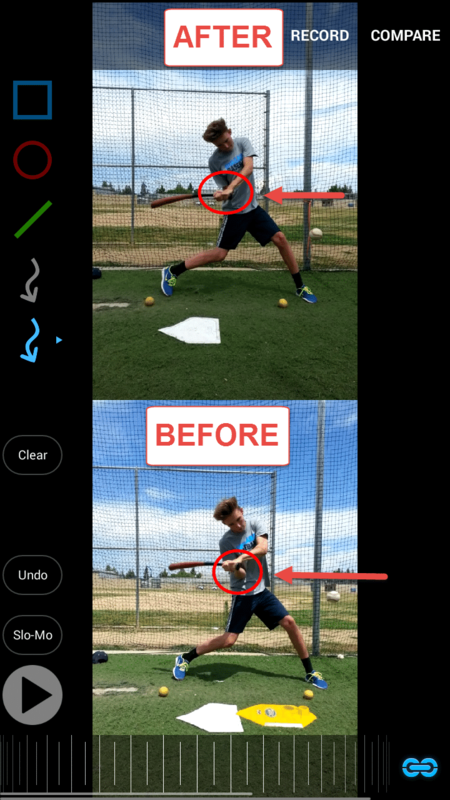 Fortunately: I do see symptoms that tend to haunt specific Rear Racing Elbow bat drag hitters. Unfortunately: I also find that the same combination of symptoms may not be present for every hitter. Fortunately: For this baseball hitting instruction drill to work, the symptoms must be present. What is Rear Racing Elbow? It’s when the rear elbow “races” passed the hands towards the middle of the body (see “BEFORE” image up and to the right). Roll over or get jammed on inside pitches. Baseball Online: Never Suffer from Bat Drag Again. Downhill shoulder angle before landing. Front Knee Action at Landing: Slight Bend or Straight? This is a major baseball hitting instruction debate among instructors I respect. They teach their hitters to keep a slight bend in the front knee at or passed impact. They point to big sluggers like Mark McGwire (pictured to the right) and Mark Teixeira, among others, as examples. 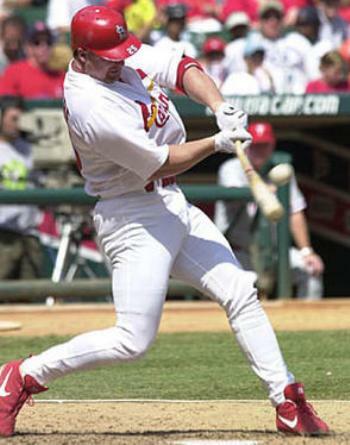 The amount of bend in the front knee up to impact will depend on the amount of forward momentum (FoMo) the hitter uses. The more FoMo a hitter uses, the more Ground Reaction Forces (GRF) are needed to transfer planes of motion from the Frontal/Coronal* (sideways) to the Transverse* (twisting). In which case, a straightening of the front knee would be highly recommended. Hitters like Jose Bautista and Josh Donaldson come to mind. On the contrary though, like a lot of big sluggers, the less forward momentum (wide to little striders), there doesn’t seem to be a need to straighten the front knee during impact. Think of a wide receiver running a 10-yard 90-degree cut route. He uses GRF and FoMo just like a hitter, but he’s transferring from Sagittal* (front) to the Frontal/Coronal* (sideways) plane of motion. In this case, he’s reaching a maximum forward running speed (FoMo), then has to cut very quickly, so you’ll see his plant leg go from bent to straight as he uses Ground Reaction Forces. Evidenced by him dropping down (or getting shorter) before making the cut. My hitter Zack is both tall (6’4″), and uses quite a bit FoMo. So, for him, when that front knee doesn’t get to straight, that’s a problem. Coupled with the issue of not getting sufficient bend in his back knee during the turn causes the pelvis to not fully rotate. And as a result, his back shoulder and arm feel like they have to do extra work. And Rear Racing Back elbow is born! *CLICK HERE for a more in-depth overview of planes of motion on Wikipedia. To get you up to speed, check out this Dustin Pedroia & how to fix stepping in the bucket post I did that will explain the use of Reactive Neuromuscular Training, or RNT. We worked on getting him to “resist the resistance” during the turn. Baseball Hitting Instruction SAFETY Issue: Please be careful with this drill. The person facilitating the front band is in the way of a swinging bat!!! To be done with adults who know better, not teammates. Please watch video above for clarification on this. A HUGE problem with younger hitters, thanks for posting! One thing that I have seen work in the past (and used for my sons) is the George Brett drill. They may not like it at first (though it is a simple thing to do) but by using this they can maintain most of their natural/normal mechanics while finding it almost impossible to allow the elbow to lead and the barrel to drop. We developed a routine by where they can use it and then slowly phase it out with no major impact to their normal training or hitting routines. Dave, could you please explain the George Brett drill? I’m not too familiar with that. Or, if you can provide a YouTube link, that would be great. Thanks for sharing. Am I right that your focus was to accelerate the hips rather than hold back the elbow and arm? The more I learn from you – and Lantz Wheeler – the more it becomes clear that most “visible” (upper body and arm?) problems are consequences of other (lower body and torso?) flaws – flaws that are not always (rarely?) physiologically nearby. Sweet. You are correct! In Zack’s particular case, we tried every upper have adjustment we could, to no avail. It wasn’t until I noticed the pattern of three symptoms that kept showing up in his swing, when I moved my focus to pelvis rotation. Also, what would be good for this particular type of hitter are jump squats. The problem is the firing of the front quad to straighten the front leg if a high amount of FoMo is present. Is Lantz Wheeler a hitting or golfing guy? Lantz is a pitching guy.